We define the quality of our company, in part, by the degree to which we can reduce our impact on the environment. This means more than auditing the materials and methods we use for the products we make. It means taking a holistic approach to all aspects of our business, which includes how we use resources at our buildings and facilities. 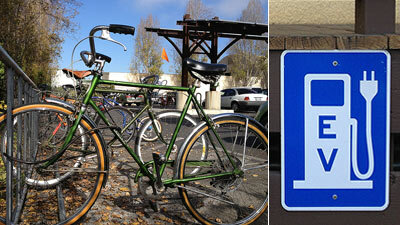 We have seven buildings on our Ventura campus. The oldest was built in the 1870s, the newest in 1997. Because they were built some years back, most do not embody real environmental concern, though all have been upgraded to improve environmental efficiencies. 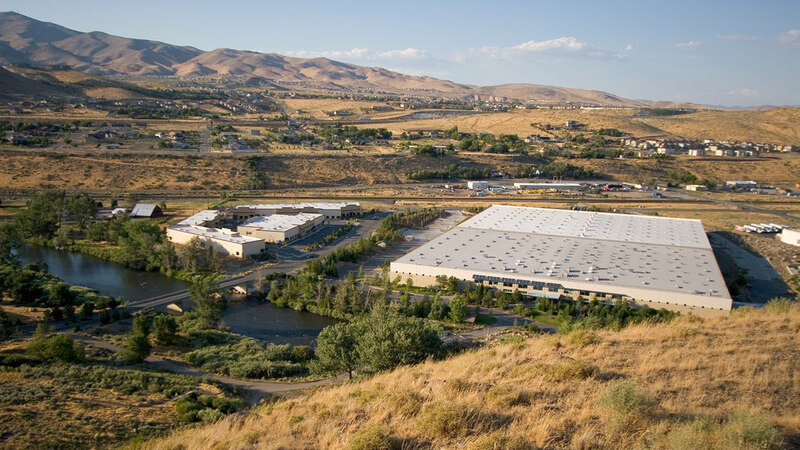 We built our Reno Service Center in 1996 at a cost of $19 million. 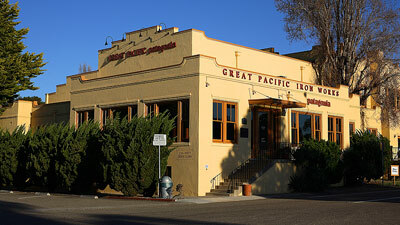 Located on the banks of the Truckee River, at the site of the old Tahoe Timber Lumber Mill, it is architecturally spare and utilitarian in design. The Reno Service Center houses the physical components required to ship Patagonia products throughout the world. Though it cost us more to build, the green innovations we incorporated into its construction paid for themselves within three to eight years with energy savings of 30-35 percent. 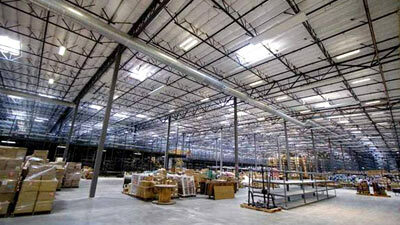 In 2006, we doubled the size of the Reno Service Center. Our many efforts to further reduce its impact on the environment earned it a gold level Leadership in Energy and Environmental Design (LEED) certification from the U.S. Green Building Council. We currently operate over 30 retail stores in North America and have a distinct philosophy when opening new ones. Ever since we transformed the former meatpacking facility (above photo) into our first store in Ventura in the early ‘70s, it’s been our belief that using and improving existing buildings, rather than constructing new ones, is the most responsible thing to do. We do our best to stick to this principle, but when we can’t, we build our buildings to last, design them with aesthetic appeal and try to make use of environmentally conscious construction materials and fixtures. And we always do our best to make our stores unique, reflecting the history and natural features of their locations. Burning nonrenewable fossil fuels to produce electricity and generate heat pollutes air, soil and water, speeds global warming and further destabilizes an already unstable world dependent on hydrocarbons. Hydroelectric dams ﬂood precious landscapes and compromise important wildlife habitat. Nuclear power poses all sorts of dire threats, among them radioactive waste, nuclear proliferation and the potential for devastating accidents. We have 498 solar panels at our headquarters that reduce our overall electricity demand from the grid by an estimated 14 percent. We retrofitted our design studio with LED lighting, which is expected to save 38 percent of the electricity previously used for lighting. In 2012, we installed a new heating, ventilation and air-conditioning system in the Lost Arrow Building. 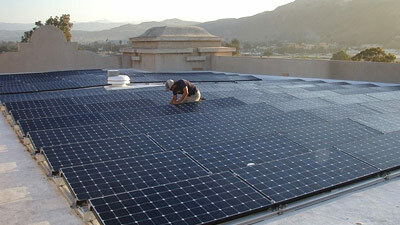 It runs on electricity and is designed to draw in air from the outside, clean it via an ultraviolet air scrubber and filter, then push it through the building to replicate an “open window environment.” We installed SMARTGRID readers throughout the building to ensure the system is circulating air appropriately. It can also heat and cool the building as needed. As part of the LEED certiﬁcation, we took a number of steps to reduce our use of energy. Skylights track the sun and translucent roof-mounted smoke vents reﬂect natural light into the Reno Service Center, which saves electricity and makes for a more pleasant work environment. Photo sensors and motion detectors on light fixtures shut lights off when they’re not being used. High-efficiency commercial boilers drive our radiant heat system. We installed R30 insulation in the roof and R12 rigid insulation on warehouse walls to help retain heat in winter and to keep the building cool in summer. We use no air-conditioning in the warehouse, instead employing a night-ﬂush vent system that replaces the hot air of day with cool, nighttime air. We installed metering equipment to ensure the Reno Service Center is operating at peak levels. The metering equipment monitors lighting systems and controls, constant- and variable-motor loads, variable-frequency-drive operations, air- and water-economizers and heat-recovery cycles, air-distribution-static pressures and ventilation-air volumes, boiler efﬁciencies, building-related-process energy systems and equipment, indoor-water riser and outdoor-irrigation systems. Facilities personnel can easily access a central workstation to review the operation of our systems. These measures result in a more energy efficient and comfortable indoor environment, while reducing both equipment and operating costs. Even small energy savings can result in large environmental and ﬁnancial gains over the years. In 2011/2012 we retrofitted two of our stores with LED lighting, which achieved a 25 percent energy savings in Ventura and 35 percent in Denver. We also installed LED lighting in our new Chicago store. When rainfall hits an impermeable surface – such as a parking lot, roof or sidewalk – it runs off, carrying with it all sorts of unsavory stuff. Garbage, animal waste, oil, gasoline, detergents, pesticides, chemical residues, brake linings, etc., are washed away, gravity carrying the polluted storm water to the lowest point, which is usually a drain. From there it might flow into a channel, a creek or river, or in coastal communities, directly into the sea. The first heavy rainfall of the season is the first flush. For health reasons, here in Ventura, swimmers and surfers are strongly advised to stay out of the ocean for 72 hours after it rains. Our Ventura headquarters is about an eighth of a mile from the Ventura River, and our Reno Service Center is on the banks of the Truckee River. To try to mitigate some of the waterborne waste that flows from our facilities, we’ve taken some measures. We replaced two sections of the asphalt in our parking lot with permeable cement, which allows rainwater to percolate through and into the soil. We also added an infiltration basin, or bioswale, and have plans to add another. 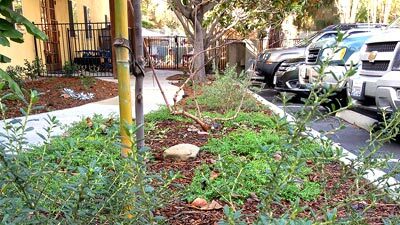 A bioswale is a low-lying, earth and gravel channel that drains part of our parking lot. 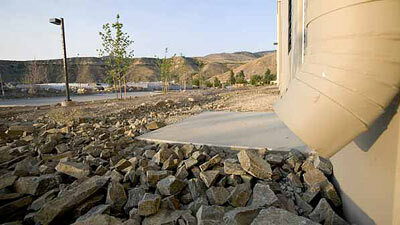 It allows storm water to soak into the soil, which naturally filters it. 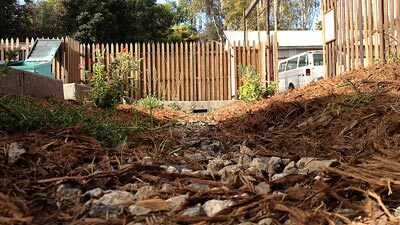 When the soil becomes too saturated, runoff flows into a storm drain. By that time, it is hoped, most of the really concentrated pollutants from our parking lot have been absorbed. When we added on to our Reno Service Center in 2007, we installed permeable cement pavers in the parking lot that allow water to percolate back into the ground. We integrated detention ponds into the landscape to capture runoff from the roof before it passes into the soil, and in the paved area of the receiving dock, we installed two sand/oil separation units to aggressively ﬁlter out contaminants before runoff heads into city storm drains. The more asphalt and cement covering the landscape, the more runoff. The more lawn non permeable and nonnative plants, the more irrigation water required. The more spray sprinklers, the more evaporation. 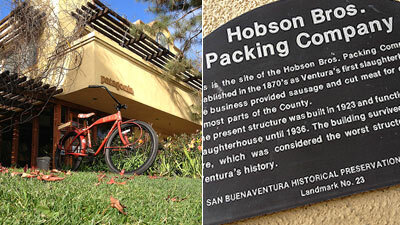 Most of the landscape at our Ventura headquarters was planted several decades ago. We have a number of mature nonnative trees and plants. In recent years, we replaced most of our lawn (which was scant to begin with) with plants, many of them native, that require little irrigation water once they’re established. Outdoor employee seating areas and meeting places are situated on permeable surfaces, and an herb garden provides forage for diners in our café. LEED standards required that we use no more than 50% of the potable water a typical commercial property of similar size in the Reno area would use for irrigation. So instead of planting a lot of thirsty plants and turf, we commissioned a landscape architect to design a xeric landscape plan that uses a variety of native plants, shrubs and trees, as well as some nonnative vegetation that doesn’t require much water. We do have a small amount of turf. Irrigation typically takes the biggest gulp of overall water use, though in the case of our Ventura campus, it’s only about five percent. Sinks, toilets, showers, washing machines, reverse osmosis systems and a dishwasher drink the rest. To reduce water use, all but a couple of urinals are waterless, which saves one gallon per flush. All commodes are dual flush (.5 gallon and 1.3 gallon). Bathroom faucets are on sensors; remove your hand and the water shuts off within two seconds. Showerheads are not low-flow. The dishwasher in our kitchen uses about two gallons per wash. The two top-load washing machines we use to “killer wash test” our fabrics in our fabric lab use 16 gallons per load. We couldn’t get the same test results with high-efficiency frontloaders. The three small areas on campus planted with turf are irrigated with pop-up sprinklers, as is a narrow strip in our parking lot that’s planted with ground cover. The rest of our campus is either on drip or requires no irrigation. Toilets use 1.6 gallons per flush. Urinals use anywhere from .25 cup to 1.5 cups per flush; two are waterless. Showers are equipped with low-flow showerheads. Bathroom faucets are standard aerator style. Two of the restrooms have motion sensors to turn them on and off. There’s one industrial dishwasher, a standard washing machine that averages five loads a day, and a test station for fishing waders, which uses the water over and over. The automobile is a wondrous tool, but it comes with some serious downsides: air pollution, including carbon dioxide, traffic and parking congestion, oil spills, etc. To try to mitigate some of the harm we do, we’ve taken a few steps to encourage our employees in North America to drive less and provided a means to recharge electric cars. Our Drive-Less program provides a monetary incentive to employees to carpool, ride a bike, skateboard, take public transit; anything but drive alone to work. It pays all U.S. and Canadian employees $2 per trip, up to two trips per day. Each employee can earn up to $500 (pre-tax) per year. In the first year, more than 900 employees participated. As a collective result, in that first year we drove 690,000 fewer miles, cut CO2 emissions by 500,000 pounds and saved 25,700 gallons of fuel. We installed two Blink electric vehicle chargers in 2012 at our Ventura headquarters for use by both Patagonia employees and the public. They’re connected to the electrical panel on the first floor of our Crystal Palace building, which is powered by solar panels. 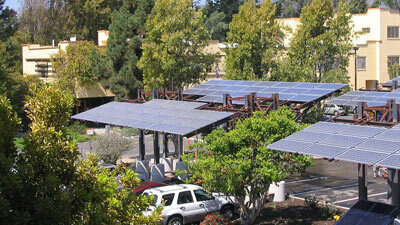 Charging times depend on the type of vehicle, and cost users $.49/kWh to charge their vehicle. 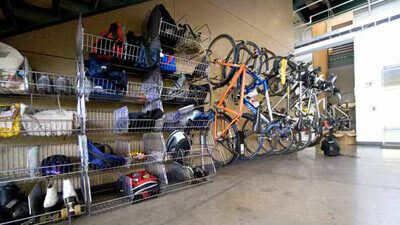 Along with monetary incentives offered to employees through our Drive-Less Program, we provide secure bicycle storage with convenient changing/shower/locker facilities for 5% or more of our employees, have a hybrid car for business use and offer preferred parking for carpoolers and employees with alternative-fuel vehicles. Patagonia supports a transition toward lower-impact energy and water sources that, combined with conservation and increased efficiencies, cause less harm to ecosystems, communities and cultures. 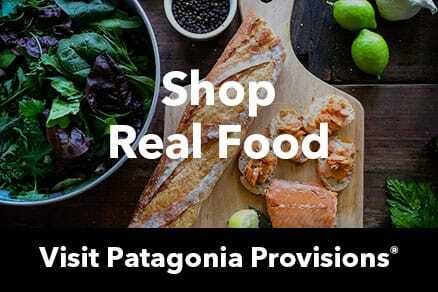 Patagonia does follow three general guidelines to help us choose as wisely as possible from available or innovate new practices and to minimize the environmental harm we cause and mitigate the effects.